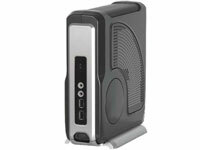 Thin Client style case suitable for wide variety of Embedded Mini-ITX boards constructed from steel and aluminium frame with a black and silver plastic shell. Drive Bays: Supports 1x 2.5in HDD or 2.5in SSD. Accessories included: Black plastic case stand. Front Panel: 2x USB 2.0 (under flap); 3.5mm Mic In and Line Out; Power button. Power supply included: 110-240V External Universal AC Adapter and UK plug; 62W Internal DC power board. Power connectors provided for 20pin ATX; 4pin 12V; SATA; Molex HDD. Supported boards: Embedded Mini-ITX boards with ATX connectors and standard height heatsinks e.g. D2500HN, JNC9KDL, D425KT, D525MW, D410PT, D510MO, later model D945GCLF, D945GCLF2; Jetway Atom & J7F2/4K/5M; Zotac ION-ITX-B/C, Fusion Boards; VIA EPIA Boards. Boards not supported: J7F2/J7F5M with CF/PCMCIA daughterboard if a HDD is used; EPIA CN 13000. Notes: Case includes larger venting panels than the original Thin Client case to assist fanless operation - any CPU fans attached to boards are still required however. SATA and 12V power connectors added from 20th July 2009. Cooling: Successful motherboard and case cooling is a combination of external environment, internal airflow, heatsink size, chassis design and workload. If considering pairing this chassis with a fanless board please read our motherboard notes - a fan may be required.